Ear acupressure therapy means to stimulate acupuncture points on an ear for treatment. 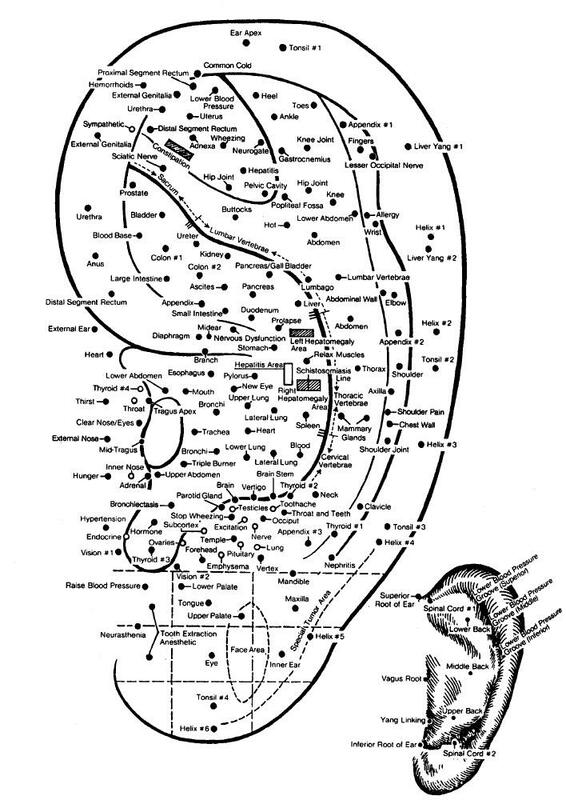 There are many acupuncture points in an ear. Each point connects to specific part of the body although it is hard to understand how it is connected. Chinese find that stimulating the acupuncture points on an ear can treat the disease in the body, since an ear contains the information of the whole body! Actually according to Chinese Medicine, any small part of the body contains the information of the whole body, such as hand, arm, leg, face, stomach, and even a finger. This is basic concept verifying the application of reflexology or tuina massage to solve disease on other part of the body. It commonly applies a herbal seed to the ear to stimulate the ear acupuncture point. Sometime, people may also use small grain of rise, or use small magnetic beards. The seeds or beards are left on the ear for several days with or without need to squeeze it. It is usually used when clients cannot come regularly for standard acupuncture treatment, or if we find sensitive spots on their ear. Many clinic conditions such as pain, poor sleeping, craving for smoking or food, can be treated by just using the ear acupressure. In some cases, it works as good as using the typical acupuncture.